Over 55 years of integrity, reliability, and convenience. 1 of the first 5 companies nationwide to provide Chevron ISOClean services. 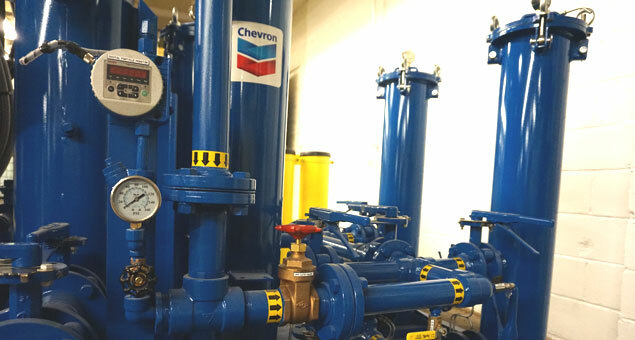 As part of our continued effort to provide the most quality products and services to help you keep your equipment running, we are proud to be one of the few companies in the country to offer Chevron’s ISOClean services. When contaminants — like metal particles and dirt — enter a machine’s lubrication zone, a chain reaction of wear begins: these particles grind away the equipment’s insides, creating more contaminants and more wear. The Chevron ISOCLEAN® Program has the solutions to fight contaminants. This premier program provides the expertise and products to increase equipment reliability and avoid equipment failure and downtime. Depending on your business – whether it’s construction, mining, waste collection, power generation, petrochemical, injection molding, marine, manufacturing or other – Chevron’s ISOCLEAN Services will help you achieve the desired cleanliness levels required in the original equipment manufacturers’ specifications. Ultimately, the performance of your equipment depends on the cleanliness and integrity of the fluid being used. Equipment operating under normal temperature with fluid systems kept free of solids, moisture and gases are likely to last significantly longer than equipment with contaminated systems. The more sophisticated the equipment, the greater the cost and potential for failure or poor performance due to contaminated fluid systems. Chrevron’s ISOCLEAN Services provided through Capital City Oil, are a proactive approach to maintaining your systems for peak performance and maximum component service life. It starts with a detailed site assessment by one of our certified ISOCLEAN technicians to establish base-line conditions and best-in-class performance standards for your specific operation. Immediate corrective action plans are recommended to get poor-performing systems up to standards or to reduce imminent threats to your production. Once under control, our ISOCLEAN technicians execute on a proactive program through advanced oil analysis and equipment inspection programs to identify problems before they shut you down. Interested in hearing from an ISOClean team expert? If not answered, leave a message and a CCO employee will return your call. You can also view a list of all 24 hour CardLock locations here on our site. © Copyright Capital City Oil. All rights reserved. Let Capital City Oil help you find the right Chevron Lubricant. Send us an email with the information below or give us a call at 800-211-8008.